It's no secret that I'm a fan of Phil Rickman, having picked up his first Merrily Watkins novel, The Wine Of Angels, some years ago shortly after it was published in paperback. The Secrets Of Pain is the eleventh of Phil Rickman's books to feature Merrily Watkins, a vicar and single mum of a teenage daughter who, as the Church of England's official exorcist (yes, they do have them) for the diocese of Hereford, is regularly embroiled in various local mysteries and tensions, often with a supernatural edge and frequently connected one way or another with the ancient history and rural folklore of the area - although these are really mysteries more akin to crime novels than horror or spec fic, they do expertly blend genres. Characters and locations recur throughout the series, and for that reason, I would suggest that someone who hadn't read any of the books would be best to start with the first in the series, or at least one of the early ones, rather than The Secrets Of Pain. 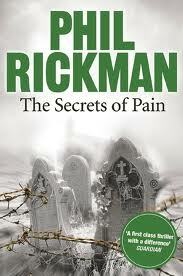 Like the previous books in the series, The Secrets Of Pain was remarkably hard to put down, not least because as well as concocting intriguing mysteries with multiple points of view, Rickman also has a particular habit of giving his chapters cliffhanger endings. With plot elements involving the murder of a prominent local farmer, the Hereford-based SAS, the sudden death of a regular character, extreme team-building bootcamps banker boys, migrant farm workers and Mithraism, there's plenty going on, and that's before you've factored in the pleasingly complicated personal lives of Merrily, her angsty daughter Jane, folk musician Lol Robinson and 'incomer' from urban Merseyside struggling to identify with the inhabitants of his decidedly rural patch, DI Francis Bliss. It's thoroughly absorbing, often thought-provoking and like all Phil Rickman's books, The Secrets Of Pain is well-structured, fast-paced and far from the cosy read you might expect from a mystery set in a village with a priestly protagonist. As a writer, Phil Rickman has a keen ear for dialogue and his style overall is generally vivid and casual. He knows how to create a disturbing atmosphere - before embarking on the Merrily Watkins series, he wrote horror, and this often shows in the best of ways. The exploration of Mithraism and why it might have become an attractive cult for soldiers was fascinating, as I would expect from one of Rickman's books: each one tends to focus on elements of folklore or history that he weaves deftly into the story. Rickman is also very perceptive in his character development, and The Secrets Of Pain is peopled with characters that are entirely believable. Those who have read other books in the series will want to greet many of them like old friends. I did feel that this particular instalment in the series contained less of Merrily than we're used to - DI Bliss probably deserves equal billing, in fact - and the paranormal elements were perhaps played down a little more than usual. Not, however, that it matters: I still found it to be a damn good read and look forward to more. There's more that I could say about this book, but most of it has been perfectly summed up in someone else's review - visit Amy Cockram's blog Stuff And Nonsense and check it out. She's got it spot-on. Having finished reading this book last night I totally agree with this review!